There I was, inhaling the scent of chocolate in the air, clutching my camera, staring at Lucie. Lucie is an enrobing machine. 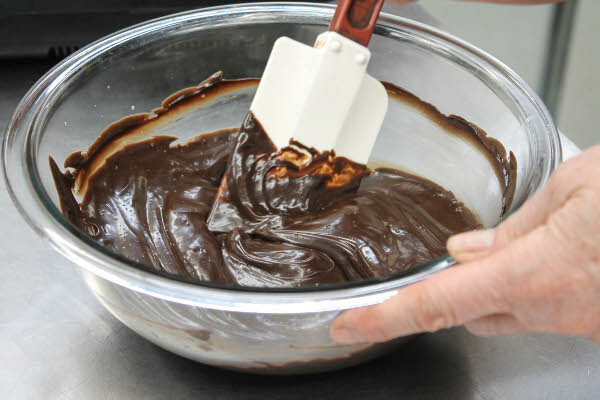 As in, she enrobes ganache (or any other bonbon fillings) in melted dark chocolate. She has 50 lbs of chocolate in her belly. 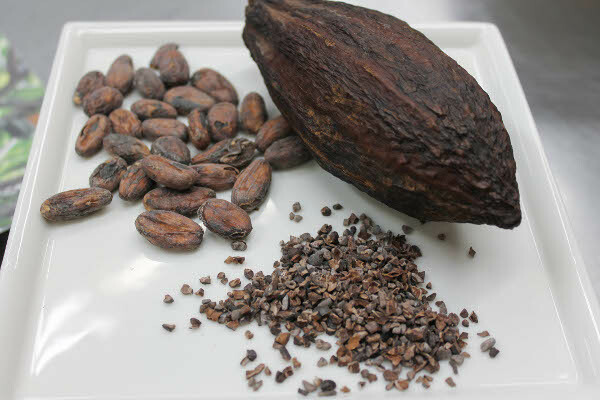 Smooth, silky, luxurious dark chocolate that perfumes the room with the aroma of heaven. 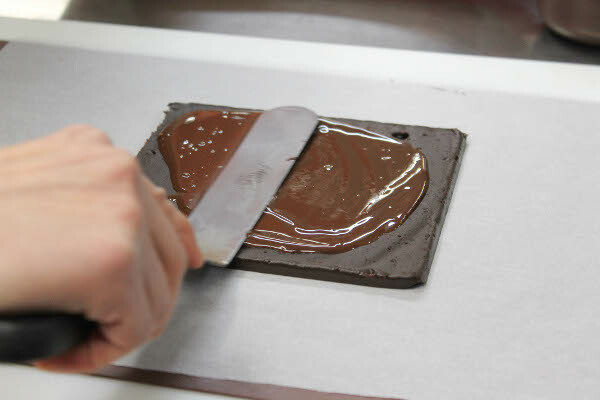 I was at EH Chocolatier for a chocolate-making class, and you bet I had the biggest smile on my face. 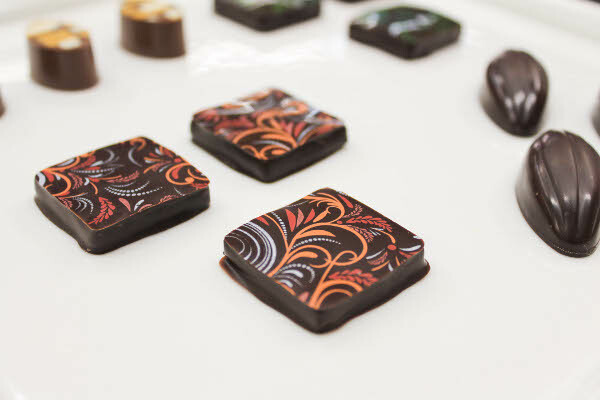 EHCh0colatier is an artisanal chocolatier, crafting beautiful confections that in my opinion are considered works of art. 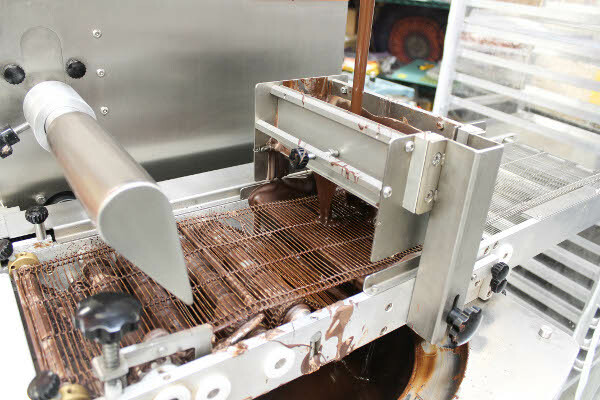 Each product is handmade in small batches, with the owners/chocolate-makers paying extraordinary attention to detail. 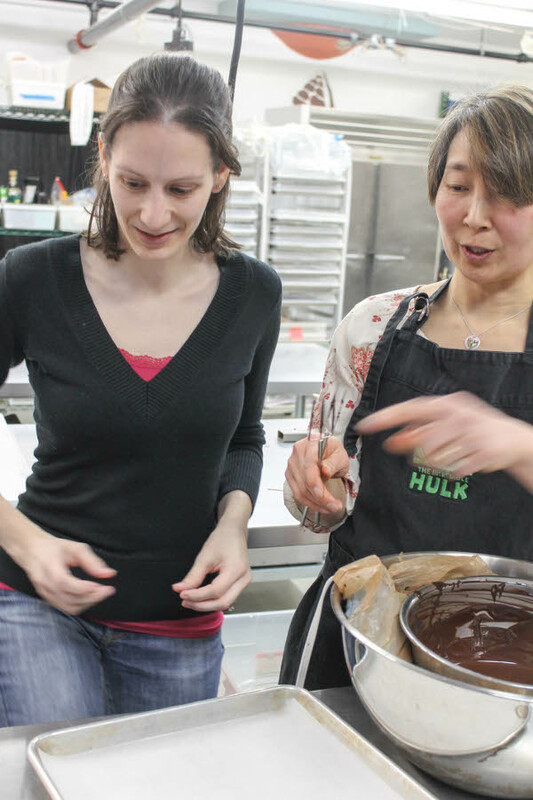 Owners Elaine Hsieh and Catharine Sweeney originally had successful careers in medicine and education, respectively, but took a giant leap of faith and oepened EHChocolatier in Somerville in 2010. When people talk about following your heart, this is what they mean. 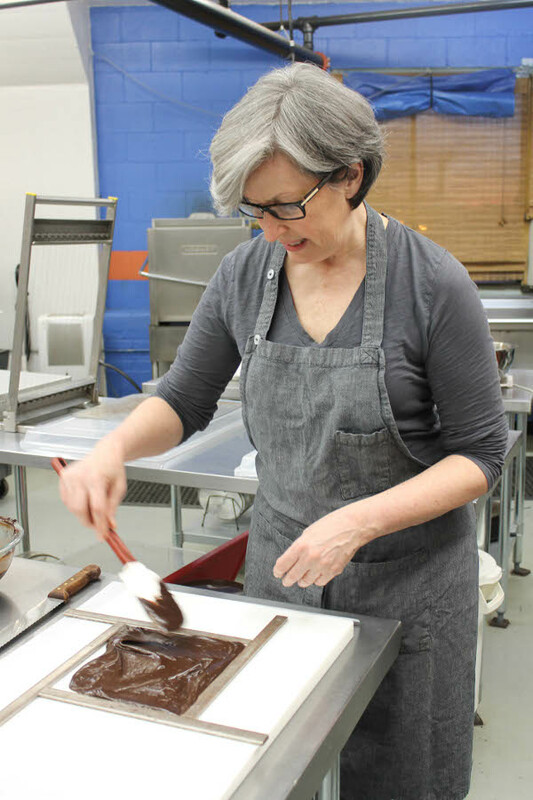 And it’s hard not to feel Elaine and Catharine’s hearts in their products – each bonbon, bar, bark, mint, cluster, caramel, macaron is made with love and a great deal of care. 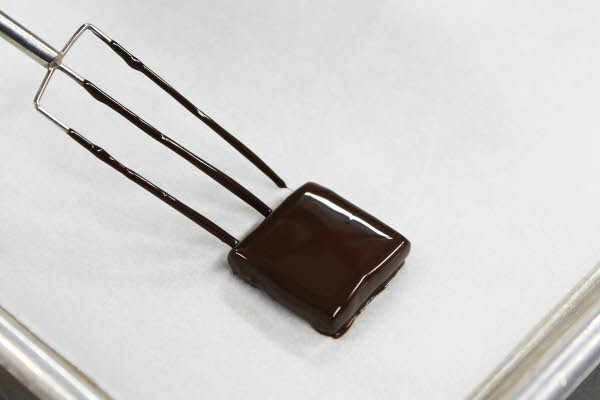 The night that we were there, we learned everything from the history of chocolate to making ganache, and a hands-on demonstration of dipping bonbons, all with plenty of chocolate-tasting in between. The kitchen is small and cozy, and Elaine and Catharine have wonderful energy between them that puts everyone at ease. 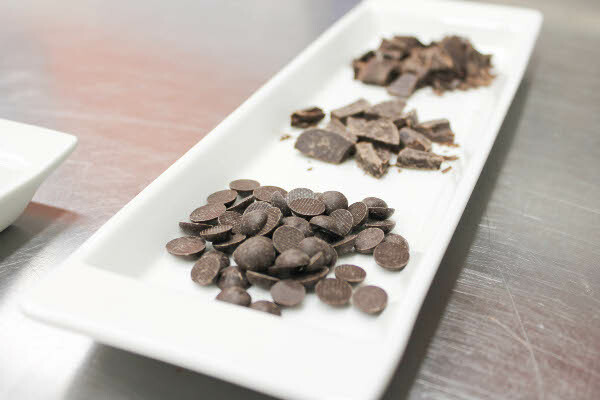 Disclaimer: I was invited to the chocolate making class and did not have to pay for it. 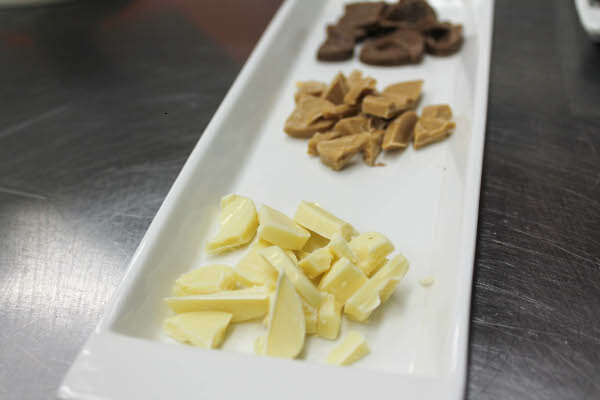 By the end of the night, we learned about different kinds of chocolate and how to temper, made our own bonbons, and sampled plenty of treats (I really, really liked the caramelized white chocolate). 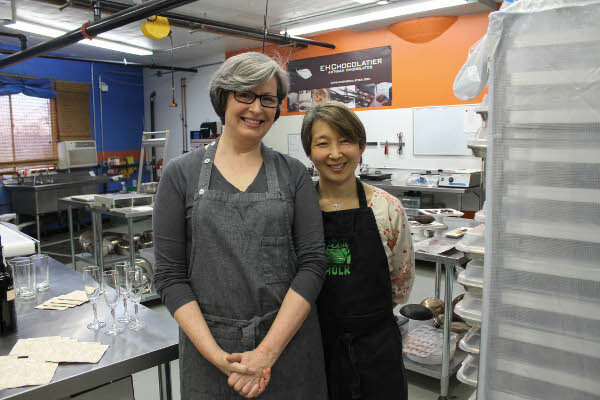 I had such a fun time, and I have even more admiration and respect for chocolatiers like Elaine and Catharine. 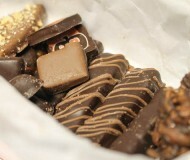 EHChocolatier products are found in specialty food shops across Boston. The factory is located in Somerville, but they ship nationally. I’ve tried plenty of their delightful chocolate and can personally vouch for the quality, freshness, and flavor. If you need to send a gift to someone, consider sending a box of their chocolates! What a wonderful, incredible experience. 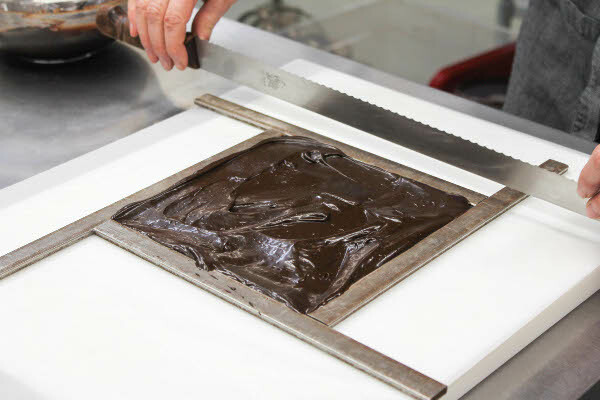 I would love to learn more about tempering chocolate – just can’t master that one! Those treats are beautiful. Great post! Oh my gosh that looks like an incredible experience! 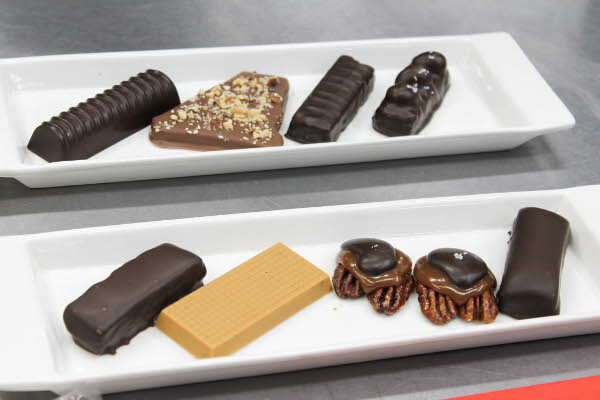 I would love to do a chocolate making class like that! Isn’t it incredible how they make it look like works of art?! Such a fun event!! I’m definitely going to have to order some of their chocolate soon. I’m already having withdrawals. That looks like such a fun experience! Plus, everything looks totally delectable. Also, a chocolate club sounds like my kind of club! how cool is this..i need to look if there is anything around here. What a neat event!!! I’d love to do something like that!! wow – what a lucky duck you are! These look jewels. What a fun class! Beautiful chocolates! Wow, what fun! That is some beautiful looking chocolate! That is such a fun class! 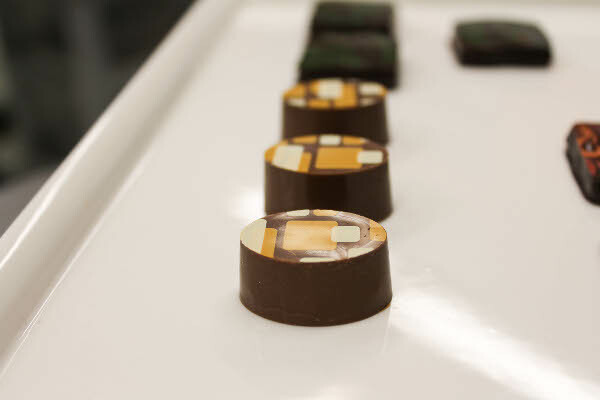 I know so little about working with chocolate even though artisan chocolate treats are some of my favorites. Sounds like you learned a ton! This was such a fun class. I love their chocolates so much! 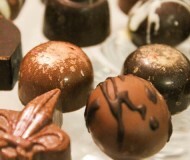 Delicious looking chocolates, so indulgent! I’m obviously missing a Lucie in my life! I have to say I’m very jealous too. This is definitely a bucket list for me. I did their CSC during its inaugural season. Their chocolates are divine. This class looks incredible!